Rising from tiny springs of rebellion in the consciousness of primitive men, democracy, like an ever expanding river, deepening and widening, has swept aside all the ancient forms of political government, and with them their pretenses of divine power and aristocratic preference. Its traditional service to humanity, however, has been only that of a negator of tyranny and presumption in the political sphere. In the future, it will be recognized and acclaimed for its more positive service in the economic sphere. Under the constant challenge of democracy, the modern state has abandoned its former attitude of arrogance and now cloaks its undertakings in such flattering phrases as “democratic government,” “rule of the people,” “equality,” “welfare state,” and so on. These pretenses have been forced upon the state by the very failure of democracy as yet to assume a positive role in the affairs of mankind. The state is a positive organ and, as such, retains the initiative and leadership to which the people must turn for the “remedy” of this ill or that. Though the state is impotent to do more than change one economic ill for another, we cannot blame the demagogy of politicians for promising salvation from all the ills of mankind. This must continue, and the people must go on suffering under the delusion that they can resort to the political means of salvation, until an agency functioning through the economic means is supplied. The ultimate accomplishment of democracy in the political sphere is the perfection of the rule of the majority. If this be all that democracy can deliver to society, the game is not worth the candle. It is little comfort to the individual, striving to express his personality, to know that democracy has wrested government from the hands of a few and placed it in the hands of a majority. Human aspirations for freedom can never be gratified as long as there is a veto power over self expression, whether imposed by a man on horseback or by means of the ballot box. Yet the democratic state has no means of functioning other than by popular elections. That being so, the functions of the state must be limited to those public services which are desired by all. Consider the folly of undertaking to express the people’s will in all human affairs by an occasional election at which, in one confused shout, we sound our yeas and nays on a multitude of questions. At the same time, we select representatives to guess what it all means, and to divine from it how to execute our will on hundreds of issues that arise after we have given our confused “mandate.” Is not our boasted political equality but the equality of frustration? Can we have self-government, and at the same time delegate the power to govern? Are we indeed fit for self-government if we accept these delusive exercises as the processes of democracy? Can democracy offer nothing better? Turn, now, from this sham democratic process offered by the state, with all its trappings of majesty, power, ritualism and futility, to a sphere in which real democratic expression obtains–so far as the state does not stultify it. This sphere of democracy has a true balloting system, whereunder every ballot is the clear and irrevocable mandate of the buyer through which he expresses his will, his aspirations, his freedom, and his personality. In this balloting system, elections are held every hour of ever day. Its voting booths are the market places of the world, its candidates, the goods and services offered by competing vendors. In this balloting system there is no tyranny by the majority. Every voter wins the elections. Whether he chooses the blue label, or the red, or the green, no one is denied his choice. Here every man is a king, and the economic constituency is made up of sovereigns in cooperation. This voting system is the elective process over which the house of economic democracy must assert its exclusive sovereignty. It dispenses with the legislative process, for it is governed not by man-made laws but by a natural law that cannot be broken or biased by any man. This law, which provides absolute equity, is the natural law of competition, or, better, the law of cooperation, since it automatically rewards him who cooperates and withholds rewards from him who does not. The house of economic democracy requires no constitution and no executive or judicial mechanisms. These powers reside in the buyer, who exercises them by the simple criterion of self interest. As the whole consists of its parts, so the exercise of these powers by buyers in endless variety and circumstance compounds the social order in perfection. Every power of the state must arise either by delegation from the citizen, or by usurpation. If we but give the matter a little independent thought, we can see that the money power can neither be delegated to the state as agent, nor exerted by it as principal. It can reside only in the same place where resides the productive power, and can be exerted only in association with the bargaining power. These powers belong not to the government, but to the individual; for he alone can produce wealth, and he alone can express selectivity and exercise the bargaining power in the market place. Professed money springing from any other source is pure counterfeit. It is a menace to the social order, which is utterly dependent upon the functioning of true money. We all know that the rise in men’s living standards from primitive times to the present has come about through the specialization of labor, which is made possible by exchange, and that this in turn has been facilitated by the use of money. But do we realize that, without the guidance of the money-pricing system, we would lack all cue as to what products we should apply our specialized labors to? Production and exchange constitute a vast cooperative system wherein the cooperators are mostly strangers and usually remote from one another. Most of civilized man’s energies are devoted to the production of things for which he as an individual has no direct use. His only way of knowing that some other individuals have use for his product, is by the reaction of the market to his product in the form of a money price. The money-pricing system is the antenna of exchange, constantly keeping the cooperative mechanism responsive to demand and supply, by bringing together those buyers and sellers who at any given moment have mutual interests–and in the process regrouping and realigning those interests. As we pass money from hand to hand, we give little thought to the delicate precision with which it preserves the equity of economic democracy and advances the social order. Every transfer of money registers an impulse on the market that changes the price of some commodity or commodities. These registered prices give the signal for more or less production of the commodities affected, thus keeping human energy, which is the generator of values, intelligently applied. This readjustment is in progress every moment of the day and night. This is the dynamics of social progress, constantly rewarding the efforts of those who conserve human energy and remain responsive to the buyer’s will, and punishing those who do not. If there can be omniscience on earth, here it abides, and it is this all-seeing eye that political planners would sacrifice for the blind directions of bureaucracies. It is through the preservation and perfection of the monetary system that economic democracy will demonstrate its potential for human welfare. In this way it will avert the disaster that is now threatened by the attempt of the state to exercise a power it cannot command. 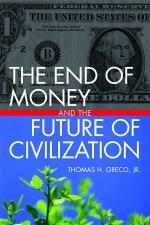 The challenge is by no means difficult if we ignore the jumble of complexities that have been written about money. Let us forget the false premise of political money power. Let us endeavor neither to reconcile the irreconcilable, nor by some protective device to legitimize the illegitimate. The establishment of a nonpolitical monetary system is but an undertaking in accountancy. Riegel’s books can be downloaded here. His Valun Mutual Money Plan can be found here on this site.–t.h.g. This entry was posted in Economics, Prescriptions, The Political Money System and tagged economic democracy, economic freedom, Riegel. Bookmark the permalink. I suppose there are different ways to read that. One thing is sure: it’s certainly ambiguous. Ralph, I like your reading better than my own, though I’d argue it’s generous. Godel was a formative thinker for me, too: reading ‘Godel, Escher, Bach’ the summer between high school and college was my first mind-breaking experience. Godel was the first mathematical postmodernist, one of the greatest minds of the twentieth century, and both a mathematician and a logician, I think. He taught me that math is good drugs. He put me on a long path of mind-breaking, which continues today. I like that you bring him up in this context. He definitely has something to say about the deep nature of truth, and about humility in the face of the search for truth. Definitely Godel is one of those minds that present you with layers of thought. When you think you’ve got a handle on it, a nother facet jumps out at you. Another interesting thinker is Philip Slater, who wrote a book(EarthWalk) in 1974 that anticipates much of what we are discussing today, includng networks and communities, and their effects on or personal nature. Another good book along these lines is “Understanding Media” by Marshall McLuhan. His exploration of all media as extensions of our minds and bodies is fascinating. Money, said McLuhan, in the information age, is metaphor. It shifts and flows and changes with the ease of an idea to fit wherever it is needed. In our post-industrial era, we still look at money as a mechanical specialist function, gears, pulleys and levers, where McLuhan writes about transition to elctronic automation and the ever increasing processes of money as it entwines with both social and productive mechanical forces. JohnStoner, I don’t think Riegel’s thoughts are an appeal to “ultimate truth”, but more an attempt to offer a diversity of approaches to truth that can be explored by everyone involved. One of my favorite ideas regarding truth, which I love to nag everyone about, is Godel’s incompleteness theorem. Godel wasn’t a mathematician, but a logician. Exploring the idea of whether mathematics in general could ever reach a complete, consistent process of defining truth, he demostrated that in fact, any consistent axiomatic formulation of number theory(of sufficient complexity) results in undecidable propositions. There is no “one way”(as far as we know axiomatically) of ever achieving truth , which makes Riegel’s ideas even more important. By allowing money as information rahter than a specialist exchange function in keeping with our outdated industrial system, Riegel would allow for just such experimentation and exploration of ideas through growing complexity and economic diversity. It’s nicwe to see such informed comments here. @Tim, the main emphasis on “money” here is not forms of government, but money itself as information, or as Michael Linton said years ago, money is the information system by which we deploy our productive efforts. Not by government decree, but simply by the power of trade to flow freely within the system as created. As to the form of “democratic” money proposed by Riegel, it is not unconstitutional, any more than the Federal Reserve is unconstitutional. 1.There is no law authorizing “Bills of Credit”, and none authorizing paper as legal tender. 2. The only legal tender mentioned is applied to the states, who are to accept nothing but gold and silver coin as tender in payment of debt. The argument as originally presented, in favor of the FRB, was that gold and silver was simply too limited to supply the expansion of co mmerce after the Civil War. A more “elastic” medium was needed to allow for the explosive grwoth occurring. In absence of any constitutional provision, SCOTUS approved legal tender on those grounds. However, as Riegel points out, that very medium, controlled centrally by the FRB, is now simp[ly too “rigid” to supply the very diversity created as a result of past economic growth. We are so far in debt, there is no hope of escaping the debt to explore necessary diversity. Money as information, flowing along computer-driven chanels, would greatly facilitate that change. I am curious as to what it is you are pushing given someone sent me a link to your site. I have only perused a few posts but haven’t seen anything of substance yet. This view of Riegel is inherently flawed. First of all, in the U.S., we do not live in a democracy. We never have. We live in a nation of laws that is defined by a Republic. Democracy leads to the tyranny of majority, will not and can not ever work without evolutionary consciousness of the human mind. We do not leave our future up to the tyranny of the majority or the minority. We leave it up to the rule of law which protects our natural rights from both. That is, until the rule of law is co-opted by corruption as it is today. So Reigel is an ideologue perpetuating a foundational supposition that is completely false. Secondly, it is naive and ignorant to view money without national borders. China, North Korea and Saudi Arabia do not embrace any type of freedoms. So, any attempt to create an international monetary system under the tyranny of the state is preposterous in its most base argument. It is even more illegitimate than is the current monetary system dominated by the concept of a reserve currency. I appreciate the search for truth. I hope there is some forthcoming on here. And, by the way, the post on China, is mildly accurate. But, the imperialistic practices of the west against China paints China as a victim. Another nontruth. China’s corrupt elites are the source of allowing the predation of the west. Thus, even adding more validation that a nationless currency is a figment of people who live in a world of fantasy and not the real world dominated by the human condition. I mean, most of this I do follow, but the part you emphasize seems like where he goes off to me. You’ve advocated repeal of legal tender laws, as I suppose Riegel would. I think that would open economic practice to experimentation on a systemic level. ‘Monetary science’ does not entail access to any sense of ‘universal truth,’ but, well, the practice of science: experimentation, refutation, validation, interpretation, and debate. Monetary science would be a social science, albeit one that produced hard numbers.